IMO N? : 5318359 Class: BV Ex Names: Seine Lloyd, Koninklijke Rotterdamse Lloyd (K.R.L. ), 1971-1977 ms Seine Lloyd, Koninklijke Nedlloyd; from 1977-1980 Nedlloyd Lines ship renamed ms. Nedlloyd Seine. Type of ship: General Cargo. 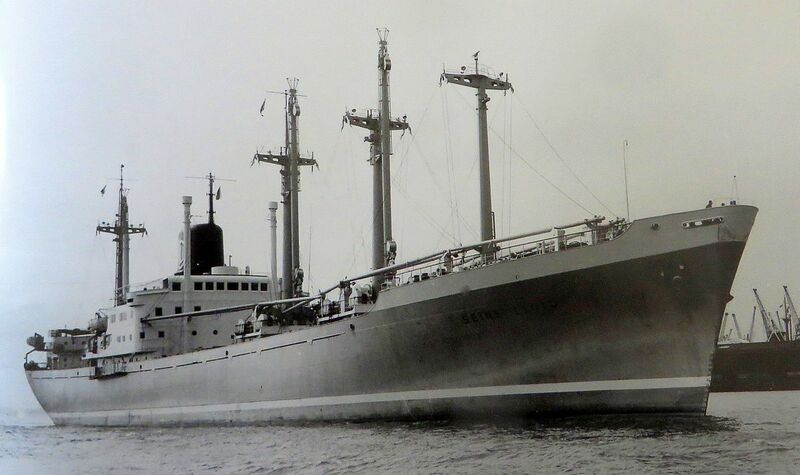 Flag: Nederland Ship?s Owners: Nedlloyd Lines Cargo Gear: Derricks: 2 x 120 tons, 1 x 65 tons, 12 x 10 tons, 8 x 5 tons DWT: 11.539 GRT: 11.539 NRT: 6.502 LOA: 166,50 Mts. Lpp: 157,15 Mts. B: 21,32 Mts. D: 13,15 Mts. Draught: 8,85 Mts. Ship?s Yard: C.van der Giessen & Zn.Scheepswerven N.V.Krimpen a/d IJssel Nederland Hull N? : 798 Date Laid Down: 09 May 1960 Launch Date: 11 January 1961 Delivery Date: 05 September 1961 Main Engine Manufacturer: Sulzer Engine bore: 900 mm Ship?s service speed: 18,00 Knots Engine number of cylinders: 6 Engine power: 10.500 BHP Engine stroke: 1.550 mm July 1982: Sold for the demolition of Thai Ruam Chit Ltd., Thailand. 23 September 1982: Departed from Singapore, still as "NEDLLOYD SEINE" but under unknown flag, with destination Ko Sichang. 17 November 1982: After arrival at Ko Sichang, the demolition started shortly afterwards.